Kirk Whalum » Austin Jazz Festival | Memorial Day Sunday| Austin Texas - Keep calm and jazz on. Kirk Whalum is brilliant, and it is an honor to have him headline the Inaugural Austin Jazz Festival. He is an undeniable master of the saxophone, a songwriter and GRAMMY award winner. Kirk is a minister with a Master of Art in Religion degree from Memphis Theological Seminary. He is a sage of life, people, fun and improvisation. “I was interested when social media developed the word ‘sharing;’ it became so much more of a big deal than it was 10, even five, years ago. These big egos we have as musicians are sometimes misunderstood,” he says, breaking it down from a multiplicity of perspective. Kirk was born in Memphis. He grew up singing in the choir at the Baptist church his father pastored. His grandmother was Thelma Twigg Whalum, a piano teacher, and his uncles included Dr. Wendell Whalum, director of the legendary Morehouse College Glee Club, and Hugh “Peanuts” Wahlum, a saxophonist who played with well-know artists including Nat King Cole. Kirk’s family members were his first musical influences. He attended Melrose High School and met his wife, Ruby, when he was 15 years old and she was 14. Kirk became a member of the Ocean of Soul marching band at Texas Southern University, where he earned a bachelor’s degree in music performance. He and Ruby married in 1980, and they are the parents of four children. A lover of languages, Kirk is fluent in French and proficient in Spanish. Kirk and Ruby once moved their family to France for two years to experience immersion in the language and culture. Recently, Kirk has studied Spanish extensively in Guatemala. “Melody is absolutely the core of this communication endeavor. Without melody, it’s like a sentence without a verb. It’s fundamental to this passion that we have to share something,” says Kirk, who still practices saxophone most every day. The path to world-renown has been rocky but clear for Kirk. Along the way to his 2011 GRAMMY award for Best Gospel Song, “It’s What I Do,” featuring Lalah Hathaway and written by his lifelong friend Jerry Peters, Kirk found himself touring for seven years with Whitney Houston. It’s his solo that we all love on her song “I Will Always Love You,” the best-selling single by a female artist in music history. In the journey from there to here, Kirk’s dabbled in everything from pop to R&B and smooth jazz. Kirk’s spiritual infusion is sublime. “My relationship with the sages, with Jesus, the radicals…it’s in those moments that are my greatest inspiration. When I’m most prolific, if that’s the word, I’m in communion with Him and most times in a subliminal kind of way,” Kirk reflects. Yet, Kirk is no dogmatist. Like his music, his being reaches beyond boundaries. “I do not claim exclusivity to the process of improvisation. For example, if you’re a Buddhist, I know you have access through meditation.” Kirk refers to himself alternately as the most-liberal conservative you’ll ever meet and the most-conservative liberal you’ll ever meet. In Austin, where he lived for a time, Kirk fits right in. In 2005, Kirk recorded the BABYFACE SONGBOOK, recapturing R&B legend Babyface’s best songs for the prior 15 years, along with smooth jazz artists trumpeter Rick Braun, guitarist Norman Brown, soprano saxophonist Dave Koz, and guitarist Chuck Loeb. Kirk began recording THE GOSPEL ACCORDING TO JAZZ in 1998. The first chapter premiered that year, the second chapter in 2002, the third chapter in 2010, and he recently completed the fourth chapter, recording live in Brooklyn, New York. Joining him on the fourth chapter are singer Shelea, GRAMMY-winning guitarist Norman Brown, Rick Braun, Kenneth T. Whalum, III, John Stoddart, Gerald Veasley and Doc Gibbs. Beginning with both his grandmothers, Kirk comes from a long line of musicians that extends into the future. His nephew Kenneth Whalum, III, has a Number One album on iCloud. His nephew Kameron Whalum plays trombone for Bruno Mars. Kirk’s son Kyle is a singer/songwriter who also plays bass with the country band TENNESSEE KINGS. But Kirk shares the music beyond his family, beyond his fans. Again breaking boundaries, he devotes time to STAX Music Academy in Memphis, where he is the Artist in Residence. One aspect of the program is to help children with musical gifts develop them to the point where they can enter programs like the industry-standard Berklee College of Music in Massachusetts. The opportunity to make the fun exponential with Kirk at the Austin Jazz Festival is one you don’t want to miss! 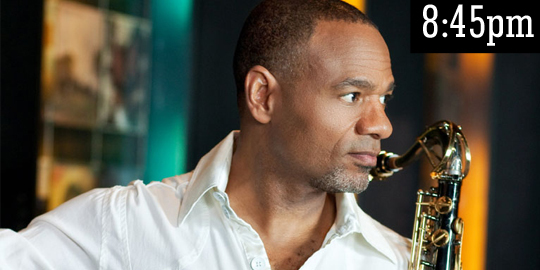 You can also connect with him at #KirkWhalum on Twitter and Kirk Whalum on Facebook. Visit Kirk’s website for more information.